Last week I wrote about a pioneer of Kalamazoo, Michigan, John DeSmit, Sr. I had learned that he was actually at least John DeSmit III because his father and grandfather who lived and died in the Netherlands, were also Jan or Jannis. Now I want to give you an idea of John’s wives and their children. This post was almost published without some very important information sent me by Adri Van Gessel indicating that John DeSmit, Sr. actually had two wives and that the first wife is the mother of only his oldest child, John DeSmit, Jr. Also, I was helped by Hubert Theuns. An enormous thank you for their help! John Sr. must have married his first wife in the Netherlands. I have not yet found the marriage record, but according to the newspaper, it was probably between 1848 and 1851, when they emigrated. Her name is listed on the death certificate of her one child, John Jr. 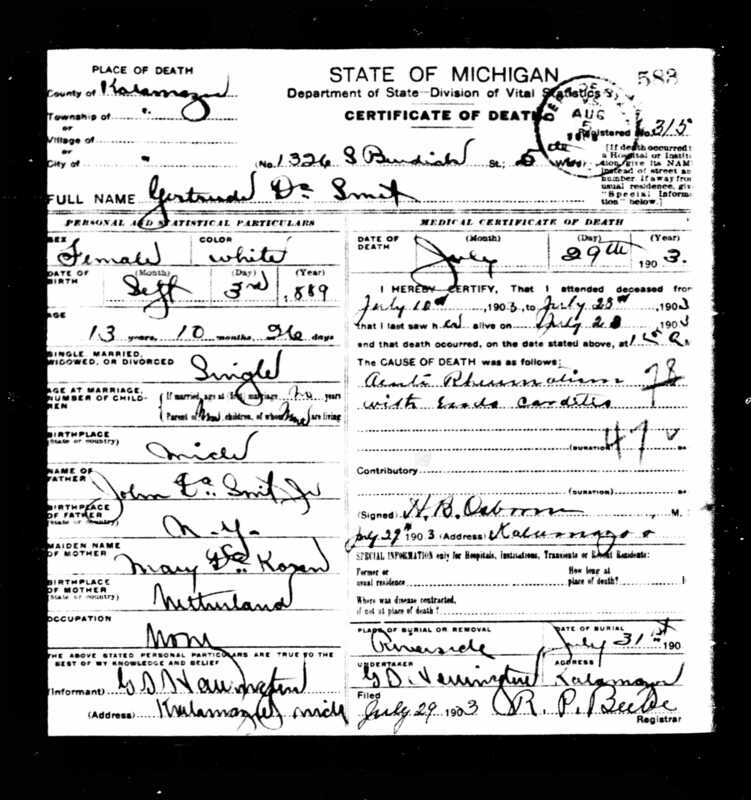 The certificate says his mother was Jennie Van S…… Could be Sluice or Sluis or Sh something. I do believe she was still alive when John moved to Kalamazoo with her and their son. According to one of the newspaper articles published on my last post, the family came to Kalamazoo on 2 May 1854. 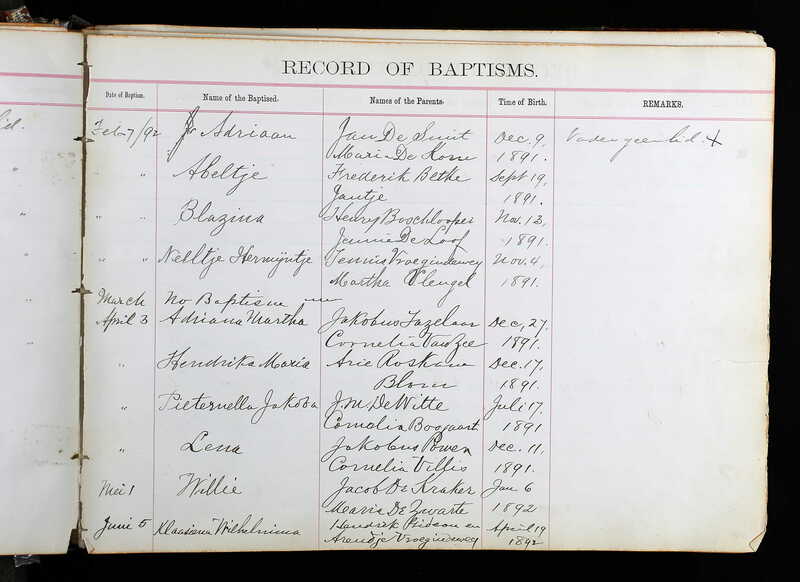 The next time we find the family “on paper,” is a marriage record between John Senior and Jacoba Lamper. 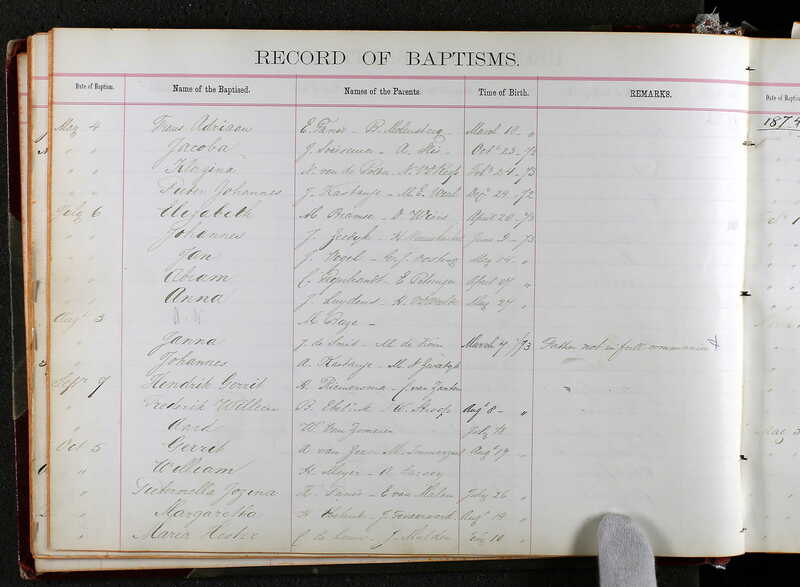 Jennie must have died between 2 May 1854 and the date of the new marriage, 7 August 1855. Jacoba was born 18 November 1827 in ‘s-Gravenpolder. Her parents were Adriaan Lamper and Christina de Bart (Lamper). This name is also elsewhere seen as de Bat and de Bath. Note for DeSmit and Lamper family members: Hubert found documents for other Lamper family members, as well as for John DeSmit’s parents, etc. If you are interested in these documents, please email about them as I am not going to post them all on here. Regarding their immigration, Hubert also found the following emigration information in http://www.zeeuwengezocht.nl/. Remember that this is emigration, not immigration, so it has to do with John leaving the Netherlands, not actually entering the United States. Although it doesn’t give much more information than the newspaper accounts did, it confirms that the couple immigrated to the United States in 1851 (and not 1850). We know they left from Rotterdam, so now it remains to be seen if I can find them through ship manifest/immigration records. According to the newspaper article, John and Jennie traveled with four other young married couples. Perhaps that will help locate them. Once John and Jennie arrived in the United States (John in wooden shoes and corduroys, as the newspaper affirmed), he sought work on Long Island, New York, where their first child, John, Jr. was born on 18 July 1853. 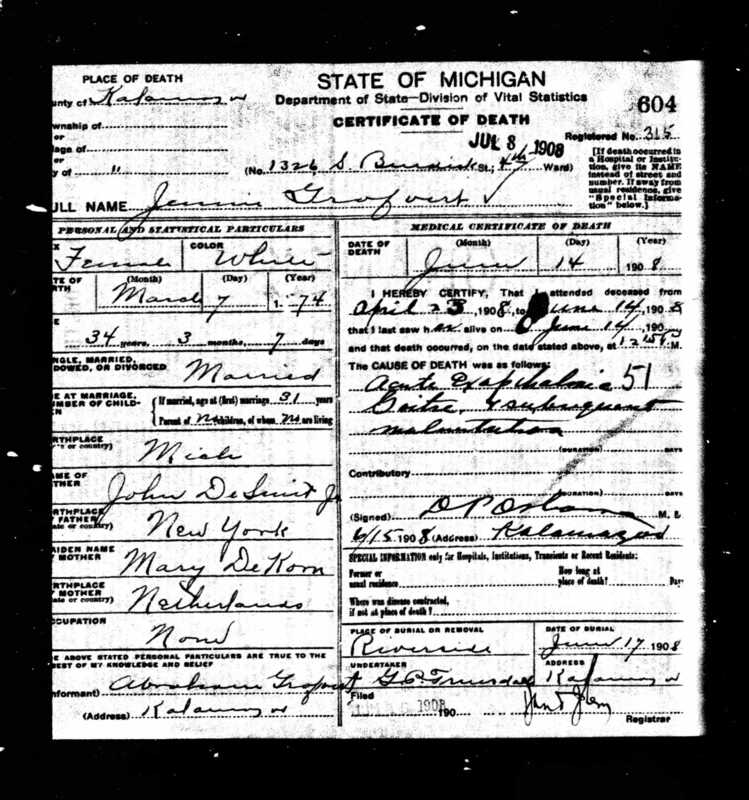 He would live a full life and die 30 October 1928 in Kalamazoo. He was married to Mary DeKorn (the sister of Richard DeKorn, my great-great-grandfather). Mary was born 4 January 1855 in Kapelle, Zeeland, Netherlands. She died 28 March 1953 in Kalamazoo. They had eight children who lived past infancy. I am not sure if I have a photo of John, Jr. 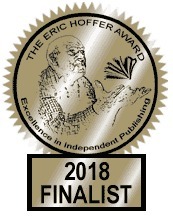 But the motivation for beginning this series on the DeSmits was because I found a little newpaper article in the Telegraph dated 11 March 1892 that mentioned John, Jr., and Richard DeKorn, my great-great-grandfather. They apparently were in partnership together until this date. Since they were both brick masons, did they work together? Or was it a realty partnership? I do not know. But it’s fitting that the brothers-in-law were partners. In 1854, John, Sr., Jennie, and John, Jr. moved to Kalamazoo. Soon after, Jennie must have died, but I can find no proof of this as of yet. I cannot find her death record, a grave record, nothing. Keep in mind that until I do all this information about the two wives is as yet unverified. As with Johns Sr. and Jr. I will mainly use the American version of the names for the rest of the children in this post. These are the children John had with Jacoba Lamper. Adrian was born 17 May 1856 and, sadly, died 9 November 1856. Francena was born 4 July 1857 and, though the couple might have celebrated the birth of a baby born on Independence Day, she died over a month later, on 27 August 1857. The death of these two children early on must have been real “dog’s weather” and “black snow” for the DeSmits. (Those are expressions he used to refer to hard times in a newspaper interview. On 4 November 1858, Adrian was born. This baby survived, living until 25 March 1938 when he died in Banks Township in Antrim County, Michigan. Adrian married Anna Versluis, and they had one daughter. Eventually, Adrian would marry Alice Nyland. The photo of Adrian is from Tim Morris. This photo was from my grandfather, Adrian Zuidweg. Halloween (October 31) 1862, Francina was born. She died 21 September 1900, still a young woman. She married Renier Van Delester (many spellings of both first and surnames). They had two sons. 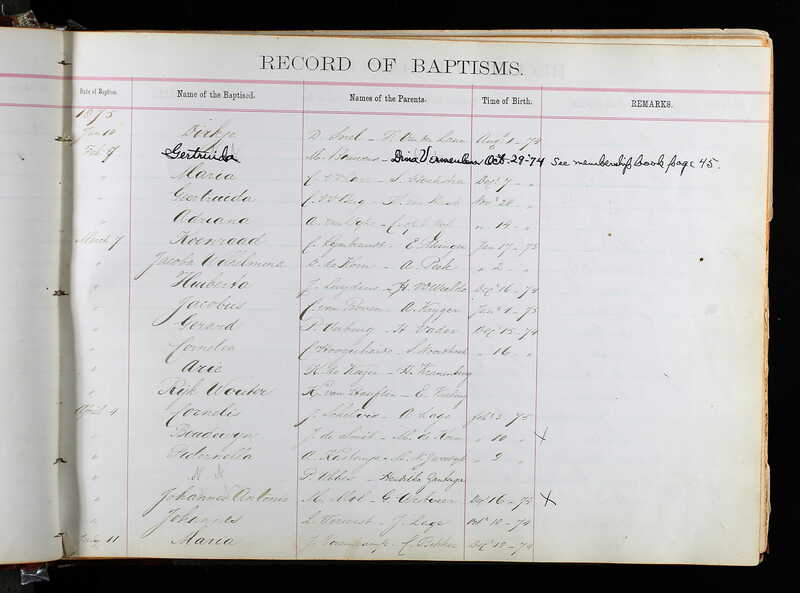 Christina was born, most likely, in September 1864. The date has not yet been discovered, other than in the Dutch Reformed Church records, where it states she was born 31 September 1864. Unless, the calendar has changed since the 1860s, there is no September 31. Christina married Jacob Flipse, Jr. They did not have children. She passed away 15 February 1914. 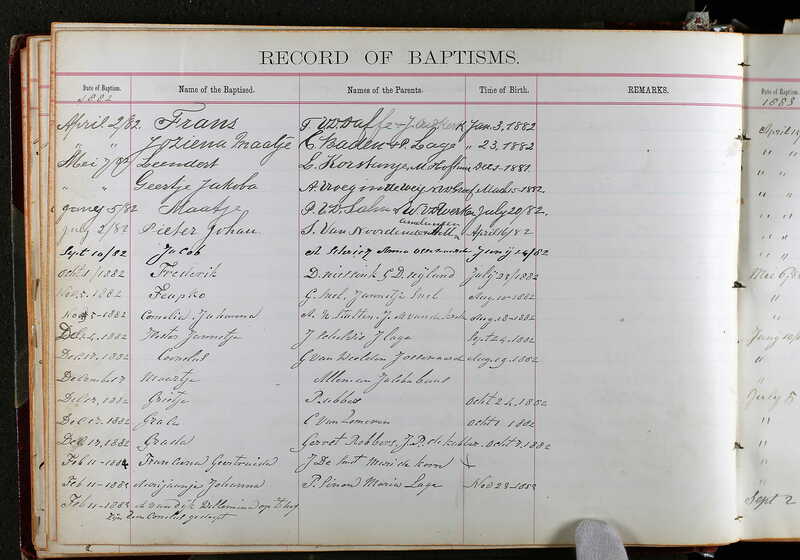 On 23 April 1866, Elizabeth was born. She married Jacob Hycoop, and they had 2 daughters. She lived until 18 May 1946. In fact, in one of the newspaper articles, it was her yard where John, Sr., hoed the celery on his birthday. 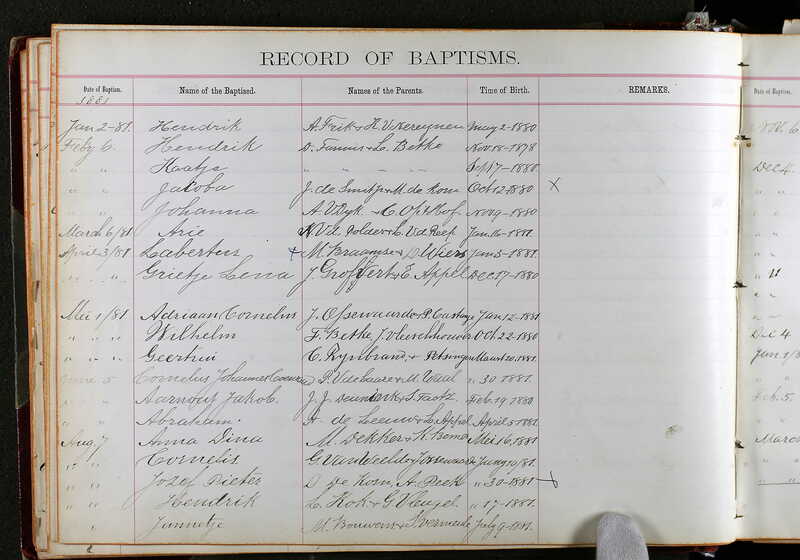 Baby Catharina was born 2 July 1869, but passed away on 16 January 1870. All except John, Jr. were born in Kalamazoo, and they all died in Michigan–most of them in Kalamazoo. In a future post I will discuss the next generation of DeSmits–the children of John, Jr., Adrian, Francina, Elizabeth, and Martin.